Mr. Hughes, certainly you must have noted: “Democrat fantasy” regarding item 2. And again, you must have read the part where: “My [personal] best guess would be the Manafort/Flynn scenario.” Your comment leads me to question your reading comprehension. Woolly, if Steele’s discoveries were used in the FISA hearing, and we don’t know the truth of that, wouldn’t the real issue be the veracity of the information rather than who paid for it? It sounds as if this is being resurrected as part of the effort to undermine whatever Mueller comes up with. I will bet a brand-new nickel that predict Mueller’s indictments tomorrow will be of the Scooter Libby sort – perjury, obstruction of justice, lying to federal agent, that type of thing – because the two investigations are so similar. We know Scooter Libby did not “out” Valerie Plame because Richard Armitage admitted he did. Armitage wasn’t prosecuted because Plame wasn’t a covert agent, hadn’t been for years. In other words , THERE WAS NO CRIME. So why’d Libby get investigated and convicted? His recollection of a phone conversation differed from Tim Russert’s. If Russert remembered correctly, then Libby must be lying, right? So that’s the entire result of the investigation – he said, he said, symbolic conviction, sentence commuted. So far, nobody has been able cite the section of the US Code that Mueller is investigating, which makes me suspect this investigation is like the Libby investigation: there is no crime. If there’s no crime, then why investigate? Politics. Democrats and Never-Trumpers couldn’t defeat Trump at the polls so they’re trying to defeat him in the courts. This has become standard practice for Democrats, first attempted under Bush and repeated under Trump. Invent an excuse to appoint a prosecutor, then undermine the new administration by investigating everybody, so nobody can get any work done, they’re too busy meeting with lawyers. That’s the real crime against the nation. Indictments typically mark the beginning of a lengthy litigation process. They seldom mark an investigation’s end. Mann, just so you get the memo, here is a story about investigative actions last year using records which the WH counsel required be preserved. These activities pre-date the news about the meeting, and are independent FROM that meeting. So, once again, there’s a whole LOT more than just that meeting pointing to Manafort being dirty as a sewer-pipe, with direct ties to the Kremlin, and along with him his protege’. They setup deals WITH Russian oligarchs, oligarchs with close ties to Putin, who don’t act without Putin’s blessing, and they setup meetings with Trump officials (including of course themselves considering Manafort was campaign manager). Trump had shady dealings with the Russians too, just how likely do you think it is that Trump DIDN’T know, and didn’t talk to Manafort or Gates about this? How likely do you think it is that Manafort offered to act on Putin’s behalf regarding sanctions? How likely is it do you think Trump was talked to about relieving sanctions? How likely do you think it is Trump knows FULLY that his staff encouraged the use of illegally obtained documents from Wilkileaks provided through the Kremlin? I think those are dots that are so easy to connect even Trump could do it. Mitch, if you want to contrast something, contrast your stories about HC’s e-mails with your silence about Manafort’s alleged conspiracy against the US. Indictments out, it’s money laundering and failing to register as agent of a foreign country. A little better than Libby or Martha Stewart, but not much. There is still nothing that’s been revealed against the Trump folks. The phony allegations have been going on for a year, and NOTHING of subsistence has been proven in that time. I wish that Trump would give Rosenstein a deadline of X days for Mueller to complete his work and close the investigation or let him go. If Rosenstein doesn’t comply then terminate him and let him take Mueller with him. There’s no reason why this theatre should go on infinitum. It seems likely that Manafort was involved in a network of money laundering and financial crimes connecting Russia, Ukraine and other post-Soviet states to the US. That is something that long predated and exists independently of Russian involvement in the 2016 campaign. A number of people in Trump’s orbit and certainly Trump himself are part of that. A lot of that money channel goes into real estate and major construction projects. If the collusion channel exists it almost certainly grows out of the money laundering channel. Since the crimes are likely more clear cut and easier to prove on the money channel, it makes sense for the prosecutions to begin there. Manny and Mitch – this is called a smoking gun, not like the BS smoking guns you all have claimed about Clinton and Benghazi, this is what a smoking gun looks like..
First, it’s the campaign CHAIRMAN, 2nd in command of the campaign, meeting with representatives from Putin’s office, and more important, read that last part again for yourself, “It has been approved from our side.” Do you think this low level operative didn’t get Manafort’s approval (given Manafort was going to be in attendance and has been charged with conspiracy against the US)? Do you SERIOUSLY think DJ Trump, one of the most hyper-controlling people in history, didn’t know, given his past dealings with Putin? Where do you think Manafort came from? Why do you think he was picked? Answer: Trump knew him from his own shady dealings with Putin and his pals, and gee, just maybe?, Putin’s staff suggested him? Ya’ think MAYBE that was possible? And MAYBE when it became clear all of Manafort’s under-handed real estate deals and washing of money for Putin’s bankers (allegedly) Trump dumped him like a hot potato, just like he did Flynn, even though Trump very likely knew of Manafort’s shadiness (just like he knew Flynn lied to Congress but did nothing for 17 days). There’s a pattern there Mann, it’s not hard to see it, combine it with Trump’s silence on Putin, his denial that ANYTHING happened, his firing of Comey, and you see a pattern as plain as a tattoo stenciled on your face Trump not only KNEW, he endorsed it, he WANTED it. He was too ignorant to know it was illegal and too unscrupulous to care that it was wrong. Our President allegedy at least, seems to have sought to collude with an enemy power, is taking payments from foreign governments while President in violation of the Emoluments Clause, and you care not at all, but HEYYYYYY, HRC allows a Russian company to bid/win a contract to run our uranium production and OMG!!!! the world is ending. So yeah, Mitch, basically people don’t care any longer about HRC’s e-mails because she didn’t have INTENT to disclose classified information, which is the INTENT part of the requirement of the law and because SHE’s not the FREAKING PRESIDENT and because she didn’t COLLUDE with our ENEMY. So yeah Mitch, it’s not news even (seemingly) though you’ve been told by your overlords to try to make it news. It’s not news, but the President collaborating with Russians, that is news Mitch and it’s high time you did your patriotic duty and called the conduct of this man the pile of pooh that it is. Bubba, it seems you don’t know beans from bullets, they were indicted for CONSPIRACY AGAINST THE US. And, these are the first indictments. Go read. I’m glad to see my prediction was right. Remember how we got here: the polls said Hillary should win. When she didn’t win, she claimed it was because the Russians hacked into election computers to change vote totals. No, they didn’t; no vote totals were changed. Hillary then claimed Russians hacked into the DNC to steal their emails to reveal truths that made her look bad. No, they didn’t, it was an inside job and the downloader is dead. Then she claimed Donald Trump colluded with the Russians to steal the election in some unspecified way. Mueller was appointed to investigate but despite a team of lawyers working round the clock for months, the best they can come up with is an irregularity in a former campaign managers tax returns from years ago. That’s outside the scope of his mandate. The charge should be dismissed and so should Mueller. And regarding the crime of meeting with foreign leaders during an election campaign, sure, let’s indict someone who did a lot of it. Sorry, Pen, but your “Trump had to have known and it was a criminal matter” is at this point conjecture. What is known for sure, and that from the Washington Post, is that the DNC and Hilliary Clinton’s campaign did pay the full expenses for the Steele dossier, and that anyone well educated in the vagaries of international politics would have known exactly who the source was. Now I’ll indulge some conjecture; I would guess that the reason the DNC server was never provided to the FBI was that a good look at its contents just might have told exactly how closely the DNC was cooperating with Putin. I would much prefer to see this investigation proceed methodically, with one key individual after another around Trump being indicted, watching Trump’s reactions, and letting Republicans attempt to defend them or remain silent. Best season of The Apprentice… ever! The sock puppet’s delusions are on display. Never mind the facts, or lack thereof. Keep it up, cupcake. Your embrace of the libturd alternate reality is endearing. You never disappoint. Nothing says “fake news” like lawyering up. Absolutely, Emery, because no one’s life has ever been destroyed by false charges that were politically popular at the time. Just ask Raymond Donovan. Every time someone hires a lawyer, that is an implicit admission of wrongdoing, which is why, of course, a lot of defendants are acquitted despite having counsel. Trump’s biggest fear is not Mueller finding collusion, it’s Mueller digging up his financial entanglements. There is a reason Trump doesn’t want to divulge details of his finances. He even told Mueller, don’t look into my finances, so naturally that’s where Mueller’s investigators went. Of course Trump doesn’t fear finding collusion. It’s not a criminal offense. And Manafort might expose Trump’s financials? OK, exactly how, given that there are no known interactions between Manafort’s businesses and Trump’s? You’re getting into some pretty wild speculation there, Emery. Unless the relationship was “more than hiring”, Trump likely knows he has little to fear in this regard. I think “low level adviser” is the 2017 equivalent of ” a third rate burglary”. Emery, your slip is showing even more than usual. What does surprise me is confidence men selling perpetual motion machines to those who do not know better. Hey, Emery, you are cluing in on Mueller after all! 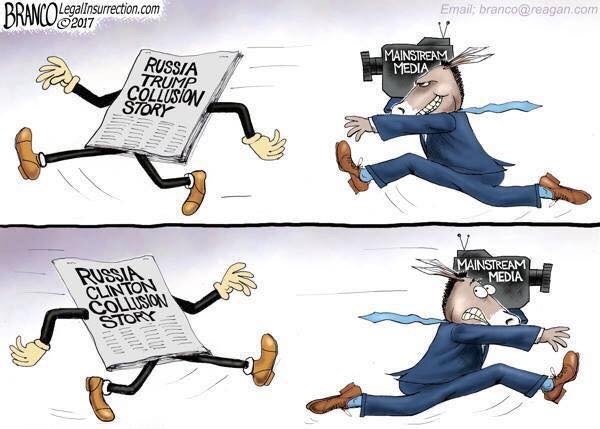 And the MSM! Heh, like Scott said, eTASS is slipping. And projecting. As usual. Ad nauseam. It is quite hilarious that the initial indictments in what will be a long running investigation have the trolls and alt right so defensive and excited in their posting. This is just the first chapter, the back ground and introduction to a few seedy smaller characters; it is an onion and the layers will take an age to peel away. Mueller comes across as a George Smiley character, slow deliberate, intelligent and very much in charge. I am really looking forward to seeing how his investigation pans out. That’s right, eTASS-BFL-SPM, Mueller will eventually get to the truth, but it will not be of the kind you would appreciate since ALL the facts and evidence so far (not that you ever cared for facts and evidence) point to malfeasance on the part of sHrllary and Clintoon machine as well as 0bumbler. Of course, I am talking about meddling in elections and not filing of forms. But hey, we do realize that in your world, filing of forms is a much more serious crime than treason. Carry on cupcake, there is a unicorn which needs to be scooped after so get to it, little doggie. What a maroon. jpa: Тише едешь — дальше будешь. One can imagine that the federal prosecutors have bushel baskets full of Trump and Trump family records and documents in their possession. If Mueller were fired, Congress would probably immediately sequester the documents and then Congressional investigators would start to put the pieces together. So like firing FBI chief Comey and getting Mueller, the firing of Mueller would probably result in the Congress taking over the investigations in some fashion. Then the remedy can only run to impeachment. The Republican party, and to a lesser extent the Democrats, have much to lose if the Washington establishment is seen as turning a blind eye to high-level tax evasion while the vast majority of Americans are operating within reasonable compliance of the tax laws. The Washington Swamp would immediately get much deeper (it seems laughable to even talk about draining that swamp). tl;dr. Vacuous, fact-free, twaddle. You really should consider writing therapy. But then you and penny and DG are all inflicted by the same mental disorder as evidenced by the lengths of your mindless rants.